For you who longing for free Android antivirus, this is an exciting THN news for you. 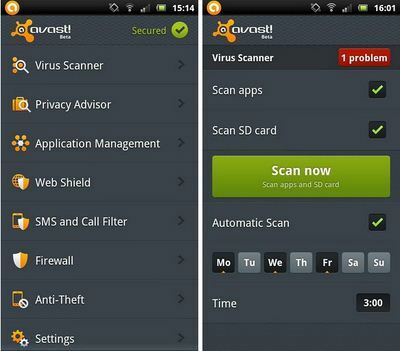 Avast, one of the famous antivirus vendors, now has launched Android Antivirus you can use for free! This Antivirus mobile is named Avast Mobile Security. Avast Free Mobile Security supports a number of features that are usually available only in paid-for Android security software. These include privacy reports, call and SMS filtering, SIM-card change notifications, firewall and application management. By using Avast Mobile Security in your Android phone, your cell phone will be protected from virus, threat, hacker, even it’s able to minimize your loss if your Android cell phone is stolen. The antivirus component supports real-time protection and automatic updates. Updates can be configured to only be downloaded over certain types of connections and the interface can be protected with a password. Call and SMS filtering can help device owners block annoying advertising calls or spam text messages. Users can define groups of phone numbers and configure the blocking intervals for them.The firewall component is only available for rooted devices because it requires special system-level access to enforce its rules. Device owners can use it to block individual applications from accessing the Internet over certain types of connections. If your cell phone Android version is Android 2.1.x, 2.2.x, or 2.3.x, so you can download and install Avast Mobile Security directly from Android Market.